What is the cutest animal you can think of? Most people say that furry animals are the most adorable. Many think that animals with giant-sized dark eyes are the most loveable. And many agree that critters with unusual abilities like being able to hang from their tails or ride on their mother’s backs are the cutest of them all. Well, picture this: a furry little creature that lives in its mum’s pouch, popping its fuzzy little head out occasionally to view the world through big liquorice eyes. Then when it is big enough to emerge from the pouch, it bounces around on gangly little legs, stopping only to munch on fresh green grass or foliage. This creature is the personification of cuteness. This creature is a swamp wallaby. Swamp wallabies are macropods. Macropods are marsupials (animals that usually carry their young in pouches) which are found on the Australian continent and they comprise kangaroos, wallabies, quokkas and tree-kangaroos. The word macropod comes from the Greek meaning for “big foot”. They all have very large hind feet for jumping/hopping and very powerful and muscly tails. Most macropods have smallish heads, large ears and the females have forward-facing pouches. If a female macropod is killed in a collision with a vehicle, her baby (joey) can actually survive the impact as it is cushioned inside her pouch. This is how we came to meet Cassius and Xena - two extraordinary little swamp wallaby joeys - that overcame almost insurmountable odds to survive in this harsh, human-focussed world. We think that Xena and Cassius were born about 10 days apart. Xena was living in her mum’s pouch in a little remnant pocket of bushland in Belrose and Cassius was living in his mum’s pouch in an area of bushland in a National Park. Neither knew of the other’s existence. Until fate intervened. Late one night, Xena’s mum was struck on Morgan Rd and killed. Xena stayed in her dead mum’s pouch and waited, crying as the flow of milk gradually stopped and the warmth from her mother ebbed away. We don’t know how long she was alone but thankfully, someone that knew to stop and check dead marsupials for pouch-young found little Xena and rang Sydney Wildlife. 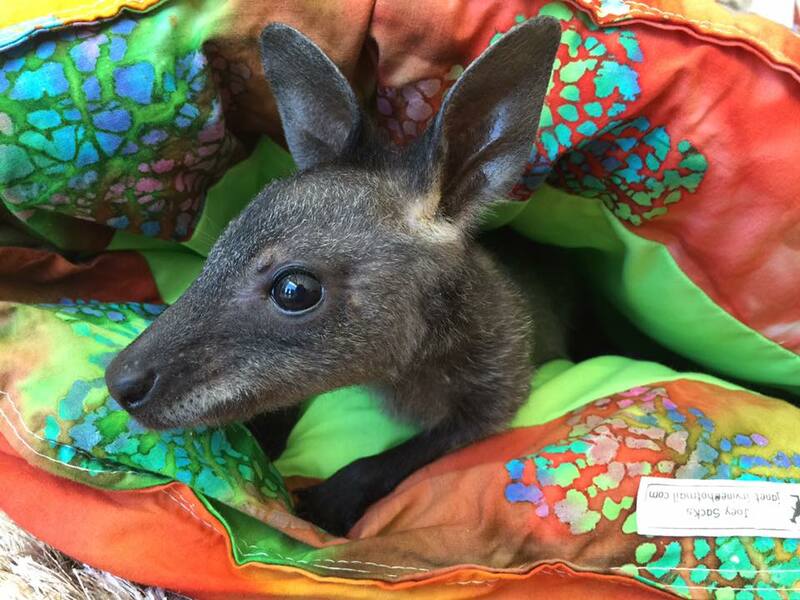 Cassius was also extracted from his deceased mum’s pouch and each joey was taken into care by different Sydney Wildlife carers and were started on 3-hourly mild feeds - day and night. Ashley became Xena’s human mum and I became Cassius’ human mum. Xena was a minuscule 173g when she was rescued from her dead mum’s pouch. Cassius was 300g when he was taken from his mum’s pouch. Both the joeys were furless when they were taken into care and these furless joeys are referred to as ‘pinkies’. Swamp wallabies can start reproducing between 15–18 months of age. Gestation is about 35 days and the tiny jelly-bean-sized joey crawls from the birth canal into the pouch, attaches to a teat and begins suckling. The young are carried in the pouch for about 8–9 months. Slowly they grew - feeding every 3 hours - and they began to get light dustings of fur. Ashley and I kept in contact and compared notes on the progress of our little joeys. The babies didn’t meet, though, until they were around 1kg in size and they have been inseparable ever since. The joeys are currently at the ‘toddler’ phase of their development. They are emerging from their artificial pouches at will and are sampling different types of grasses and foliage and are still on 4 and 5-hourly milk feeds respectively. When they are older, they will be transferred to Sydney Wildlife’s Rehabilitation and Pre-release Facility where they will begin the process of ‘dehumanisation’. As they will be released back to the wild, they will need to learn not to depend on humans for their needs. At the Pre-release Facility, they will be in a bushy area where they will learn to browse, contend with all types of weather, learn different types of bush smells and figure out how best to deal with parasites like flies, ticks and leeches. They do all this in a controlled environment away from human dangers and predators. We are thoroughly enjoying these joeys at the moment but because the goal is to have them released into the wild as nature intended, we will need to start ‘backing off’ when the time is right.